Founded in 1976, Marine Concepts strived to be one of the first companies to provide a full line of design & engineering services for its customers while ensuring that all projects from design to production, are completed to the highest quality standards. Eventually, the company would be recognized for its services and become known as “The Next Generation in Design, Engineering, and Tooling.” Marine Concepts employs specialists with years of experience in design, engineering, CNC milling, plug building, and mold production. With experienced staff and state-of-the-art CNC machines, they provide a variety of composite and fiberglass solutions to their clients. Customers in a variety of industries from boating, wind power production, aerospace, automotive, and even theme parks utilize quality products made by Marine Concepts. Marine Concepts is headquartered in Cape Coral, Florida. In 2012, the company opened an additional facility in Sarasota, Florida to fulfill its growing demand. Between the two locations, Marine Concepts has over 300,000 square feet of manufacturing and office space. Yet, with the increased space and capabilities, came an increased demand for accuracy and efficiency from their application teams. With these new demands in mind, Marine Concepts analyzed their metrology department, and, in the interest of their customers, decided to explore the newest technologies in metrology. The company’s analysis concluded it needed a laser tracker with extended capabilities. Marine Concepts required a tracker that could not only inspect parts, but also maintain the accuracies needed to compensate their CNC mills. The company also needed to find equipment that would allow them to go beyond the capabilities of an SMR. Marine Concepts contacted API for assistance with finding a laser tracker with this functionality. API introduced Marine Concepts to the Radian Plus laser tracker paired with the vProbe. Marine Concepts quickly discovered that the Radian Plus and vProbe met all the requirements they had. With in-line accuracy of 0.0066mm at 20 meters, the Plus allows Marine Concepts to quickly gather accurate data on their 73’ long CNC. And the vProbe expands their target abilities beyond what a simple SMR can do. With the added benefit of the Plus’ built-in auto-lock capabilities, the company no longer worries about interferences with the laser beam. At just 11kg, and completely wireless, the Radian Plus is the perfect solution for Marine Concepts to measure even the smallest parts. In the past, the company had to haul bulky equipment around and wait nearly 45 minutes to take measurements. With the Plus’ easy setup and quick warm-up, they can get to work much quicker. The added versatility of the vProbe also enables Marine Concepts to inspect grooves and scribe lines in a matter of seconds. The old solution for this inspection was more time-consuming and required additional setups that reduced the accuracy of the results. 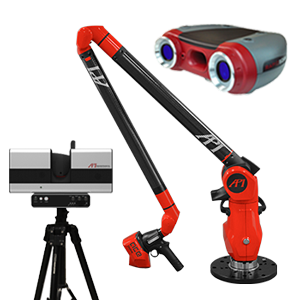 Overall, the Radian Plus with the vProbe have greatly improved efficiencies in Marine Concepts metrology department. Marine Concepts inspects complex parts for customers in a variety of industries which include shipping, energy, and aerospace. Due to the critical nature of these industries, there is no room for error when inspecting parts. Marine Concepts counts on the Radian Plus and vProbe to ensure these parts are inspected to the highest level of accuracy possible. For over 30 years, API has used advanced metrology to develop customized solutions for the world’s leading companies like Boeing, Lockheed Martin, Northrop Grumman, Voith Hydro, Duke Energy, Ford and many others. API offers a unique mix of innovative engineering capabilities, superior product quality, and outstanding customer service to help improve your business and bottom line. API’s award-winning products are manufactured in the United States and are used by many of the world’s leading automotive, aerospace, shipbuilding, machine tool, and energy companies.